Selected as Party of the Day on July 23rd! When my client approached me to assist with her sons graduation, she wanted to surprise him with the overall theme, his love and passion-FOOTBALL! I had so many ideas run through my mind on what style I wanted this party to be. I wanted something mature, classy yet sporty at the same time and also using the graduates school colors and mascot! I set the entrance with an amazing 3.5ft tall helmet by Hand Made For You- she does amazing wood cutouts and I cannot get over how amazing she is! All of my centerpieces were made with real football items like footballs, helmets and lots of grass! I used Create Ur Plates for guests to enjoy their dinner and really get a feel for a fully custom party. I created mini picture confetti images of the graduate throughout the tables. I tried for the first time using Guestbook Stores album and it was such a hit! I used my Instax mini which these credit card sized pictures were the perfect size to add to the guest book. I loved how this was customized to the graduates name and event date with some really sweet questions for guests to answer. For my dessert table I contacted Bellaria Bakery to create some stand up cookies along with the ends that match the school logo and mascot, she did such an amazing job with these! I added some cute football cake pops by Jaya Jolie’s Confections over some clear acrylic stands with books and a football! For the first time I added brigadeiro to our dessert table in Coconut and Lemon, they were delicious, such a cute sweets addition for a dessert table in which the way they are displayed is how she provided these to me! 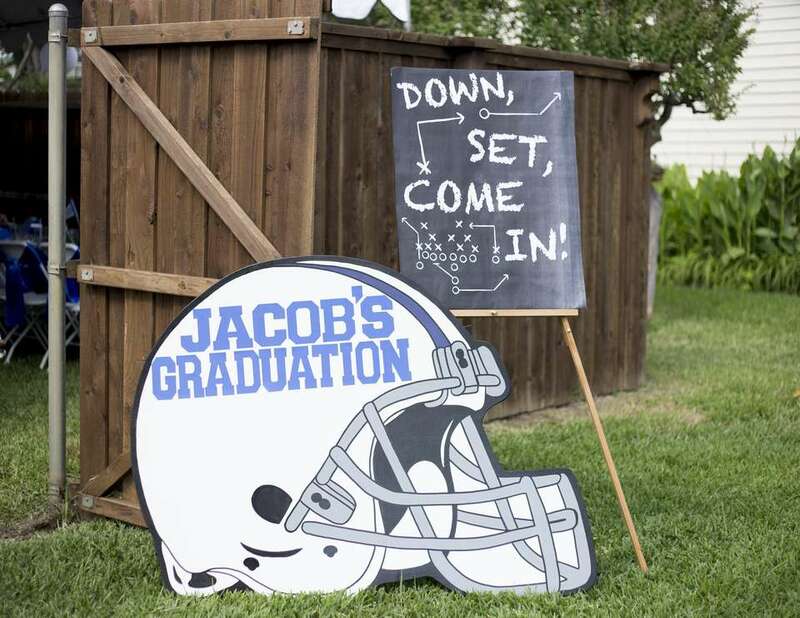 I truly enjoyed styling this lucky grads party-best of luck and congrats to Jacob!